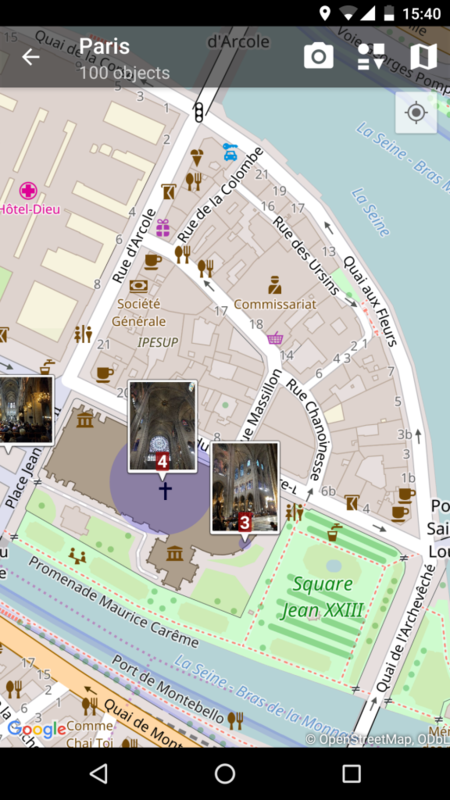 Enjoy your photos being placed on the new high resolution OpenStreetMap available in PhotoMap. OpenStreetMap is a collaborative project to create a free editable world map. It comes with lots of details such as toilets, pharmacies, cafes, banks, parking, schools, walking tracks, gravel paths and many more. At the beginning it could be a bit slower to load the map. But the great thing is that downloaded tiles are cached by PhotoMap. That makes them available even offline. You can adjust the cache size up to 1000 MB in the settings of PhotoMap. I have OsmAnd+ with tons of offlinemaps installed on my Android. How can I use these offline Maps ? It’s not possible to use the offline Maps of a different app. Unfortunately, I don’t know the format that is used by OsmAnd+ to store the OSM map data.